MILK CAPS for MOOOLA is a program sponsored by Longmont Dairy that helps students earn money for their school and students. 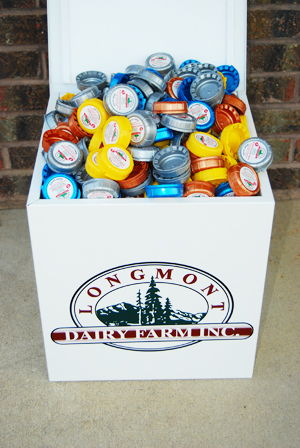 Longmont Dairy milk caps are worth 5¢ each and are redeemable for cash by participating schools only. Participating is easy as 1-2-3! Save the bottle caps. Save as many as you can—from your bottles, or collect them from your family and neighbors. Bring your milk caps to school and put them into the collection box in your classroom. For more information on how the program works, you can download and print the Milk Caps for MOOOLA FAQ flier. If you would like apply to earn money for your school, please contact Gary Schlagel, our Community Service Director, to let him know you’re interested and for approval. If your school is chosen to participate, you may download and complete the application form. In the first year of the program, we collected around 25,000 caps. Now, we collect a weekly average of 40,000 caps during the school year. To date 3,750,000 caps have been collected – with $175,000 donated to schools. Read the full story.